This article will be used by teachers who wish to know about reports and how to access them. Complete Gradebook (Published Assignments): Includes a summary of all student's published grades by period. This report can be printed with either student names or student ID numbers. Complete Gradebook (All Assignments): Includes a summary of all grades (published and unpublished alike), as well as all student assignments by period. This report can be printed with either student names or student ID numbers. Grades: Shows all students' current grade averages by period. This report can be printed either with both student names and IDs or with student IDs alone. The data in these reports can be sorted by name/ID or by percent average. 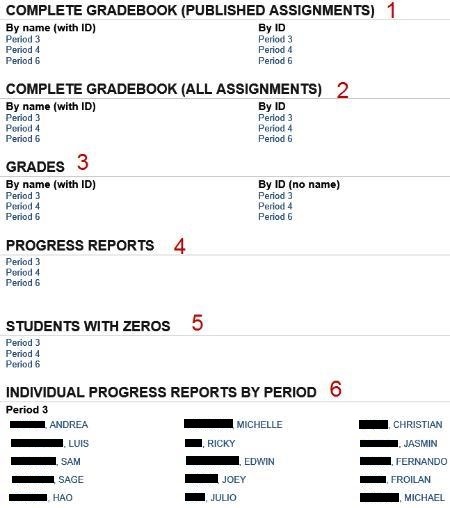 Progress Reports: Shows a summary report for each student by period. Each student's report starts on a new page. Students With Zeros Report: Shows a list of each student's zero grades by period. Individual Progress Reports by Period: Shows a single student's current grade averages by period. This report can be printed with either both the student's name and ID or the student's ID alone. Click the More pulldown menu for the desired Classroom. Alternatively, click the Reports tab from the Gradebook.